Project Body Smart | Tired but wired: Why you can’t lose weight? Tired but wired: Why you can’t lose weight? Stress factor … more to weight loss than eating and exercise, says nutritionist. Eating and exercise aren’t the only things that impact our weight and health. Physical and emotional stress can also tip the balance of our nervous system and our scales. Take, for example, Susan a strikingly tall and physically beautiful woman, whose nutrition was top notch and whose booze consumption wasn’t big. But, she had started putting on weight and couldn’t understand why. Slow down … Dr Libby Weaver ties weight gain to stress. So, she went to see dietition and biochemist, Dr Libby Weaver. Weaver herself was stumped by Susan’s mysterious situation and fossicked for extra information. But, Susan was adamant nothing in her life had changed to explain the weight gain. She had gone from one a day to as many as four a day over a three to four month period. “But, they are all black coffees, so there are no calories in them,” she assured Weaver. At this revelation, Weaver’s eyes lit up and when Susan saw the look on her face she began to cry. “Please don’t take them away from me,” she begged. 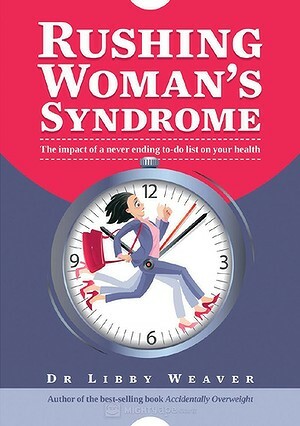 The reason was simple, Weaver explains in her book Rushing Woman’s Syndrome and it had nothing to do with a reduction of calories. The biochemical dance produced by chronic stress, along with its emotional and physical impact, is what Weaver explains in Rushing Woman’s Syndrome. In our information-saturated society, Weaver doesn’t believe it is a lack of knowledge that causes people to be overweight or unhealthy, rather this sense of emotional ‘pressure’ can lead us to make poor choices. This can help to explain why intense exercise and curbing calories can be counter-productive in times of stress and why weight-loss doesn’t just come down to the calories we consume. It is also the reason that Weaver believes we need to bring the body back into balance first by addressing our stress issues before our weight issues. “Most people believe that in order to become healthy, they must lose some weight. I believe the opposite is true; in order to lose weight, we must become healthy,” she says. If you can’t get away from your desk, schedule a reminder on your computer to stop and take 20 long, slow breaths into the diaphram.